For the Enterprise Architect to stay relevant in the agile organization it is my view this is achieved by becoming a coach to all the persons and teams in the organization. And the enterprise architect should be coaching in the domains people, process and technology. People, Process and technology are the same domains as we know from the Enterprise Architecture Models TOGAF, IAF and DYA. When an Enterprise Architect is not able to coach people, thus not able to help a person to make the step from “Unconscious incompetent” to “Conscious incompetent” and then bring them in contact with experts to evolve to “Conscious competence” then what is the added value of this E.A.? What is the value that an Enterprise delivers to an Enterprise? A product that the Enterprise Architect in the non-agile did deliver where architecture principles, target architecture, domain decomposition overview etc. But when just a few people in the organization can read and understand these products, and 99% of the company does not read them, let alone does not implement it in a different way of working? What is then the added value? What is the net-result then? Not over-thinking a target architecture in contrast to the old role of an E.A..
Find the balance between the knowledge and design that is needed to define the target solution while not overstepping the boundaries of the agile team autonomy. This balance will be different per person, team and organization. 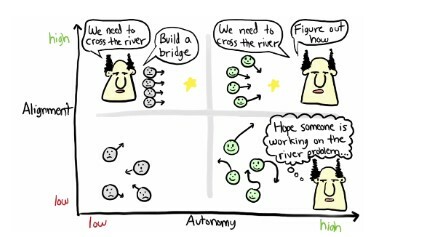 This implies that the EA should most of the time be coaching key stakeholders so that they can change the people (team) around them so that in an organization with high autonomy and high alignment, the teams move into a predictable direction. This balance can only be found when the E.A. is a master in the topics and is able to communicate differently per situation per person. Just as Louis van Gaal. When not focusing on continuous improvement but only focussing in producing a “thing” failure will come to you. And the reality is that most current Enterprise Architects will not fit this profile.